Although Russia signaled that it would veto the US/UK/France UN Security Council Resolution adding sanctions on the Syrian government over allegations that it used chemical weapons on its own people, the Resolution was brought to a vote anyway today. In the end, it was vetoed by Russia, China, and Bolivia, with three additional countries abstaining. The Resolution and accompanying sanctions were a classic case of guilty until proven innocent, as the investigations into the alleged use of chlorine gas are ongoing and have established no definitive proof of Syrian government culpability. That did not stop President Trump’s “Disaster Ambassador,” Nikki Haley, from once again displaying her astonishing ignorance in a blistering (but groundless) attack on Russia and China for not falling in line behind the US-led sanctions effort. When you hear members of the Security Council speak about the use of chemical weapons, it’s pretty amazing because you have unity in the fact that we need to be concerned about chemical weapons use in Syria and elsewhere. That is why the blocking of this resolution is so troubling. This is the same approach to Syria that the Obama Administration has taken since 2013: taking the word of the rebels — all of which according to Rep. Tulsi Gabbard (D-HI), who was in Syria, are radical extremists — as fact. That is how so much US weaponry sent to “moderates” in Syria ended up in the hands of al-Qaeda and ISIS. 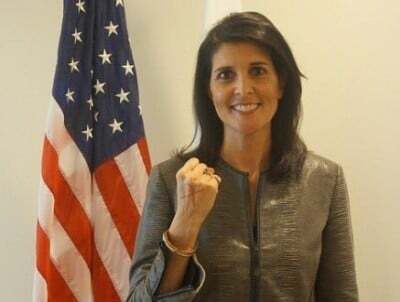 Yet President Trump’s Ambassador to the UN is ready to take the word of the radicals and terrorists over the Syrian government, which is fighting radicals and terrorists. Russia and China made an outrageous and indefensible choice today. They refused to hold Bashar al-Assad’s regime accountable for the use of chemical weapons. But Assad has not been found guilty of the use of chemical weapons. It was a flawed investigation that used testimony of disreputable special interest groups to push a “regime change” agenda. And like the Obama Administration before it, Trump’s Ambassador is going right along with the program. Including taking as gospel reports from the George Soros-funded Human Rights Watch, which has been firmly on the side of regime change in Syria. Investigative journalist Robert Parry reported last year that UN investigators looking into the use of chlorine gas by the Syrian government were given evidence that jihadist groups were staging false flags to blame the Syrian government. They chose to ignore the reports. United Nations investigators encountered evidence that alleged chemical weapons attacks by the Syrian military were staged by jihadist rebels and their supporters, but still decided to blame the government for two incidents in which chlorine was allegedly dispersed via improvised explosives dropped by helicopters.In both cases, the Syrian government denied that it had any aircraft in the areas at the times of the purported attacks, but the U.N. team rejected that explanation with the curious argument that Syria failed to provide flight records to corroborate the absence of any flights. Yet, if there had been no flights, there would be no flight records. The U.N. team also dismissed out of hand the possibility that jihadist rebels who had overrun some air bases and thus had operational helicopters at their disposal might have used them as part of a staged event designed to incriminate the Damascus regime and thus justify U.S. or other outside military intervention. Another problem with the U.N. team’s findings is that the home-made chlorine bombs had minimal military value, inflicting relatively few casualties and only a handful of deaths. Why the Syrian government, which was under intense international pressure regarding alleged chemical weapons use and was in the process of surrendering its stockpile of such weapons, would have jerry-rigged a handful of homemade bombs and dropped them for no discernible military effect makes little sense. But that doesn’t faze Haley. Like her predecessor, Samantha Power, for Nikki Haley and her UN team any evidence contrary to the pre-determined conclusion is to be ignored. Now step back from the Security Council. The reason we all should care about this resolution is that we want to make sure no one ever thinks about using chemical weapons. Here again we have Obama era hypocrisy on display. The US government has admitted it used deadly depleted uranium munitions in Syria thousands of times. Unproven and illogical allegations that the Syrian government used chlorine gas on its own citizens must be punished, according to Ambassador Haley. But the self-admitted fact that the US has also used a horrible form of mass weapon — depleted uranium — in Syria is completely ignored. And again, why would Assad use chlorine gas on his own people? The majority of the Syrian population support Assad, for one. Why would he want to gas them? Also, when facing a fight for survival against al-Qaeda, ISIS, and other foreign-backed extremist groups, why waste time and risk the wrath of the international community to use such an inefficient weapon as chlorine gas? According to the big Human Rights Watch report released earlier this month, up to nine people were killed in the attacks blamed on Assad. Nine people! Might the desperate terrorist groups, who are losing territory every day, not have the incentive to frame the Assad government by either faking a chlorine attack or making an attack and blaming it on the Syrian government? After all, even Ambassador Haley has admitted that the rebels have also used chemical weapons. The Great Nikki Haley Train Wreck continues. And with it goes any hope that President Trump will pursue a foreign policy in any way resembling the one he promised on the campaign trail.